This is a method of exfoliation that consists of using a scalpel to gently scrape off the top layer of dulling dead skin cells in order to reveal a smoother, brighter complexion. It is a favourite facial treatment in the entertainment industry, especially among models and actresses. Why? Because, it also eliminates that annoying peach fuzz that cakes up in makeup and which can be enhanced by harsh production lighting and high-definition cameras. Dermaplaning removes all the dead skin cells and also the facial hair, leaving the surface very smooth. It also allows for greater penetration of skincare products and creates a flawless canvas for makeup to glide on smoothly. In fact, cosmetic dermatologists often use it to help prepare skin for more intrusive procedures such as laser treatments and chemical peels. After a treatment, you’ll immediately look more radiant with a more even skin tone and texture. All of your peach fuzz will be gone, which is why first-timers say their skin has never felt so soft before. It is well suited for drier skin types and for anyone who wants to get rid of peach fuzz. There are no side effects and zero downtime. After the treatment, your skin will be highly sensitive to sun exposure and may already look very pink, so be sure to wear a broad-spectrum sunscreen with SPF 30 or higher to reduce the risk of hyperpigmentation. 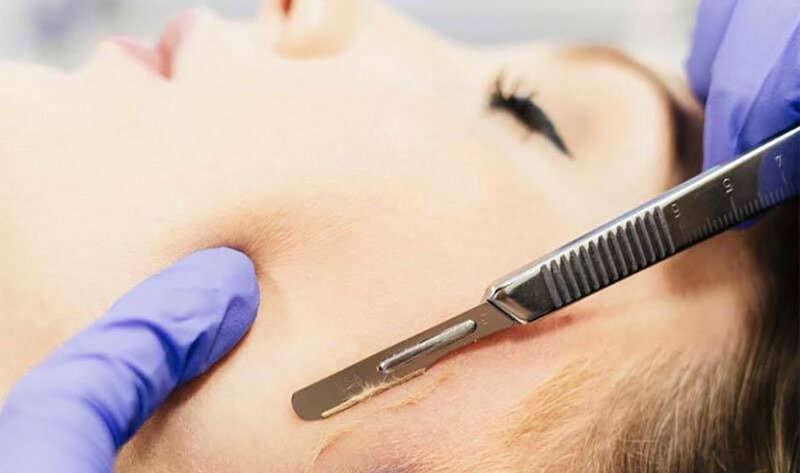 Dermaplaning removes 28 days worth of dead skin cells, so it’s best to allow the skin to complete its rejuvenation cycle before your next treatment.